The gray wolf, also known as the timber wolf, is the ancestor of almost all modern wolves and, while wildlife biologists don't always agree on scientific classifications, one thing is certain: whenever the interests of humans and Canis lupus clash, the wolves are the losers. Today, many distinctive populations of wolves, called subspecies, are on the critically endangered list but others are gone forever. Except for being larger and heavier, the dire, meaning "fearful," wolf closely resembled the modern gray wolf and, for a time, these distinct species coexisted in the same geographic areas. The dire wolf arrived on the scene about 300,000 years ago, ranging from southern Alberta to southern Bolivia, but both subspecies became extinct about 12,000 years ago. Kenai Peninsula wolves weighing up to 200 pounds, used to roam the Kenai Peninsula of Alaska, but the Gold Rush of the 1800s marked the beginning of the end for them. Wolves of Canada's Far North now considered extinct include Bernard's wolf and the British Columbia wolf. 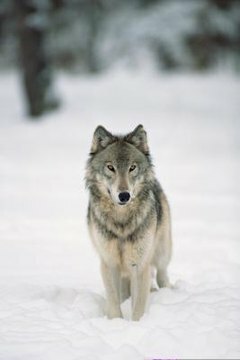 Seven subspecies of the gray wolf, named according to their geographical range, used to roam free in the Americas but were hunted, trapped and poisoned to extinction: the Newfoundland wolf, Mogollon Mountain wolf, which is also known as the Southwestern wolf, Cascade Mountain wolf, Great Plains wolf, Northern Rocky Mountain wolf and Southern Rocky Mountain wolf. The Manitoba wolf is listed as extinct but there is some dispute about whether it ever existed at all. The Mexican wolf, North America's most genetically distinct subspecies, was once deemed to be extinct in the wild but successfully bred in captivity, reintroduced to reclaim its territory, and upgraded to critically endangered. Efforts to save the six European subspecies of the gray wolf from extinction by breeding them in captivity and returning them to the wild have been controversial but largely successful. The International Wolf Center deems Europe's wolf population as "mostly stable, slightly increasing." The International Wolf Center identifies six gray wolf subspecies in Asia and Africa and notes that a small, highly endangered population exists in Egypt. As for the others, populations are listed as stable but slightly decreasing in south and west Asia. Wolf stories abound in Japanese folklore, but in reality, both species of wolf native to the islands in this archipelago have been extinct for more than a century. In 1905, the last Honshu wolf succumbed to an epidemic of rabies and other contagious diseases. On Hokkaido, the second-largest of Japan's islands, another subspecies of wolf was poisoned into extinction in 1889 by ranchers who saw them as a threat to livestock. Like many unique species Down Under, the thylacine resembled nothing else on Earth. Striped like a tiger, but built like a wolf, the Tasmanian tiger-wolf actually was neither, but a marsupial like the kangaroo, with a pouch for carrying its young. It became extinct on mainland Australia thousands of years ago because it couldn't compete with the dingo for food, but thrived on the island of Tasmania until Europeans arrived. In 1936, the last one died in captivity.